"Safety and security from Silent Call ..."
Where there's smoke, there's the potential for danger. 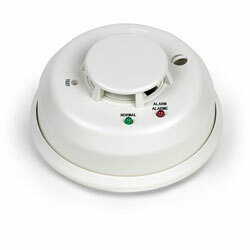 Become aware of it and the potential for fire with the Medallion Series Smoke Detector with Transmitter. When the photocell detector senses the presence of smoke, the built-in transmitter broadcasts a signal to any Medallion Series Mini Receiver. Easy to install in any room, it is powered by a long-life, 3-volt lithium battery for round-the-clock, 24-hour protection.